Our first flock at Hermit House. We wanted a fresh and local source of meat and eggs, so we decided to raise our first flock of chickens in the summer of 2013. We started with 23 Cochin and Leghorn chicks. We lost one the first night due to the stress of relocation, but the other 22 grew to maturity (see image above). A little later than optimal, we culled all but one of the males – leaving 11 hens and one rooster. Our homegrown, free-range, organic eggs and meat were so much better than the supermarket. There was no going back. Mr’s heritage flock at Hermit House. We had two wonderful years with this flock before a fox broke in and we lost almost all our chickens. We invested in a new fox proof coop for our remaining birds, along with eight new heritage chickens (see image above). The coop arrived in two large parts and to get it into the back garden we had to take it apart and put it back together again. It took us about two days to complete this. The Hermit House Wood Workshop begins! During this process, Ted gained the confidence to consider building coops. This option would make it possible for us to breed pure heritage chicks. This kick-started the Hermit House Wood Workshop. Ted soon found out how satisfying it was for him to build with wood. Our toolset grew to the point where we had to rearrange the house to turn the largest room into the workshop. Due to ill health, we had to close the workshop at the end of 2017, after completing a number of coops. Until this point, we were considering plans to expand into a poultry conservancy, but this was no longer possible. However, this didn’t stop us entirely. We still had 45 wonderful chickens under our care. So we decided to go in a different direction. 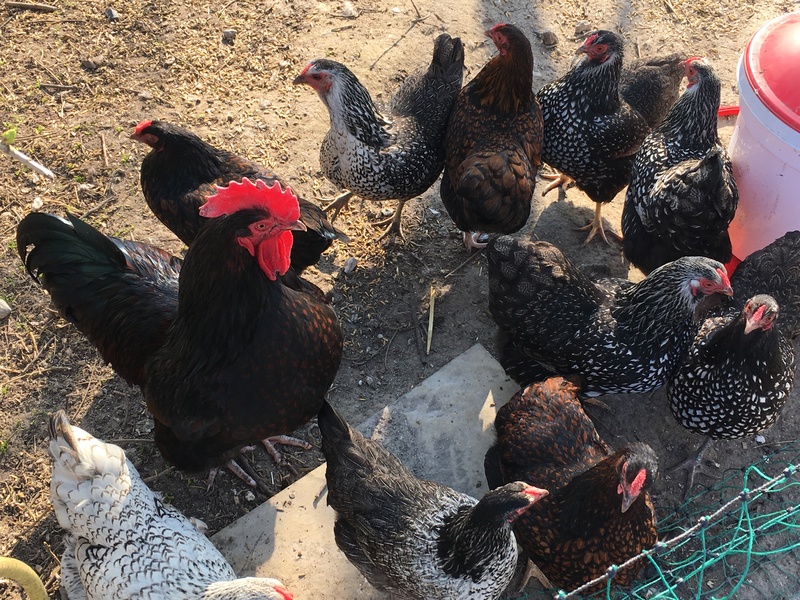 We wanted to start sharing our knowledge of backyard chicken keeping and to journal our ongoing journey with our beautiful birds.